Rocky II: It’s a knockout! 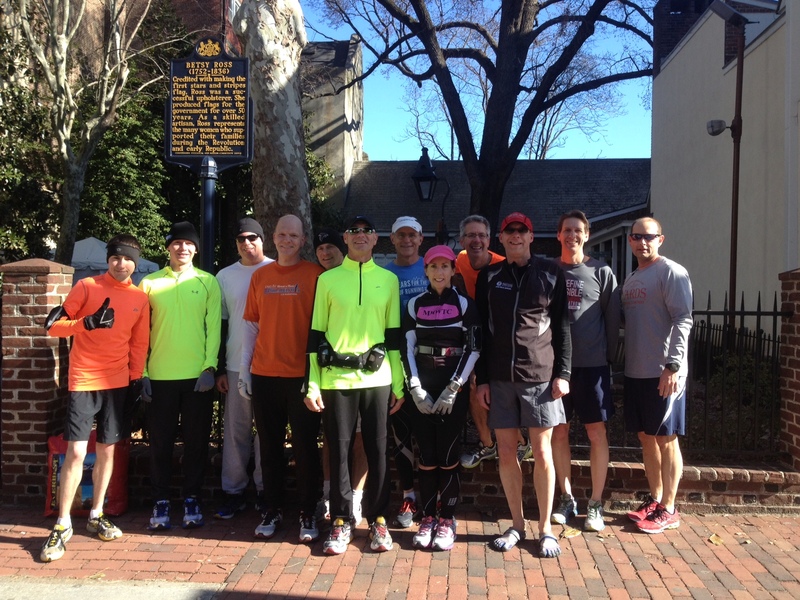 Haddonfield, N.J. – Last Sunday morning, fifteen members of the South Jersey Athletic Club gathered in front of the Haddonfield Running Company for the start of Rocky II, a point to point run from Haddonfield to the finish at the top of the steps of the Philadelphia Art Museum. It was a perfect day for this type of run. It was bit chilly at the start, around 37 degrees F, with the sun just starting to peak over the buildings on King’s Highway. 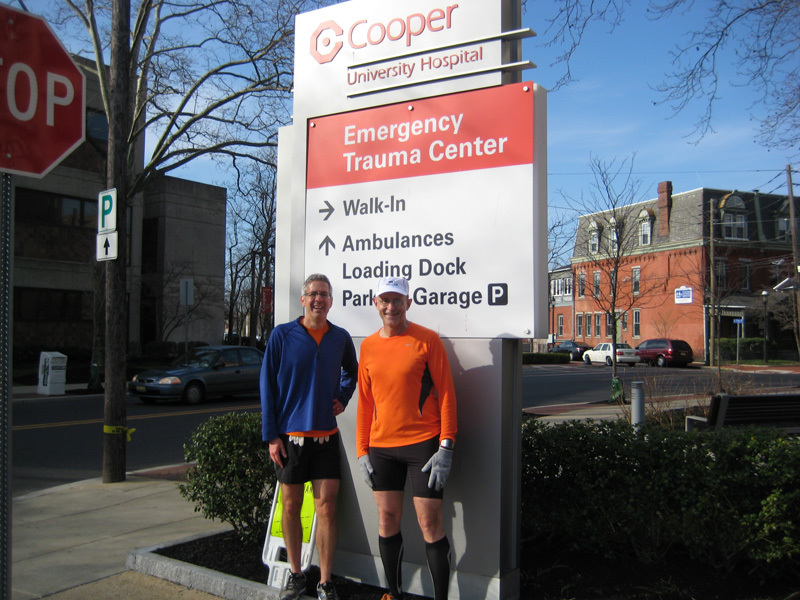 The runners stowed their gear in the bag carrier’s car and prepared to get going. The bag carrier, Craig, was the son of the organizer, and had offered his time in exchange for his Dad’s gratitude and the promise of brunch with the group. 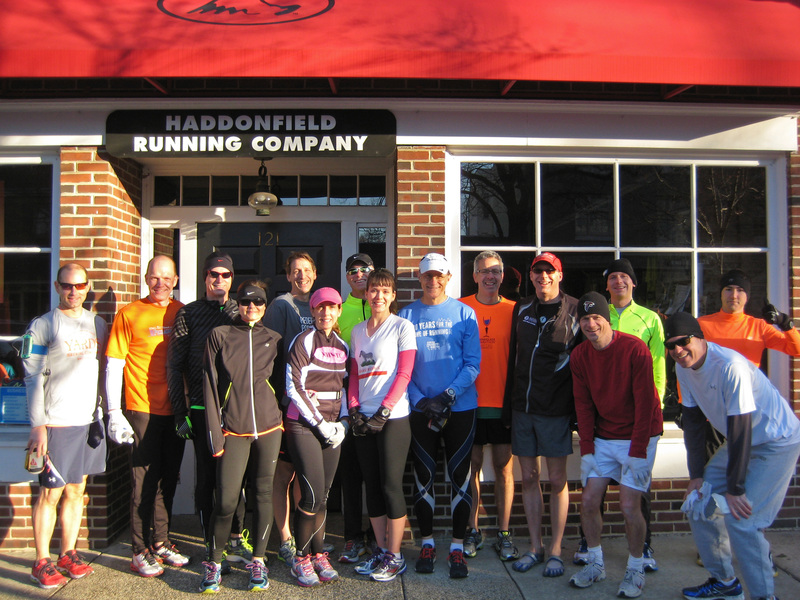 The club, known as SJAC, has a usual Sunday run which is a loop of about 13 miles. Every once in a while, though, a different run is proposed to add some variety and challenge. The first Rocky Run was just about a year ago, so it was time for the sequel. The route this year was very similar to last year’s route. It follows the usual Sunday morning route up to Route 130, which is a busy highway on the edge of Camden. This year, we went across 130 and past the Camden County Golf Academy, formerly known as the Cooper River driving range. This has a sixty station, double-decker driving range where one is expected to hit the ball into the water. Once merely a driving range, it is now home to Rutgers Camden’s golf program. Moving on, we ran along Admiral Wilson Boulevard, where the memory of strip clubs and cheap motels, torn down for the Republican National Convention in Philadelphia in 2000 is fading. Now, it is a rarely used park, with pretty rose bushes lining the boulevard, and a wide paved curving path along which few bikes or runners pass. The park ends on a narrow sidewalk at the edge of the road, which takes one in to Camden City proper. Up the Ben Franklin Bridge walkway. break and water. Then it was on to the Ben Franklin Bridge. The road through Camden goes past the Rand Transportation Center. 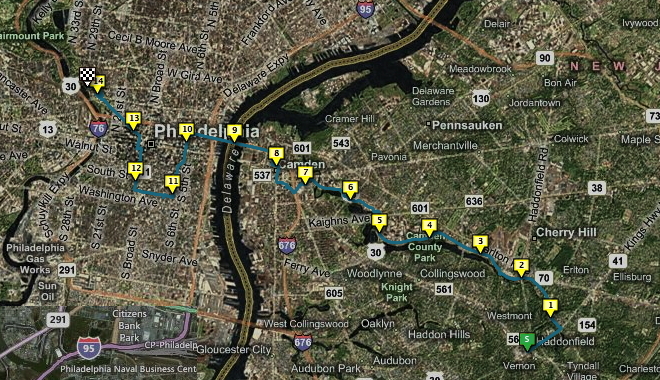 Here, the PATCO line into Philadelphia, the River Line to Trenton, and the New Jersey Transit buses all come together. 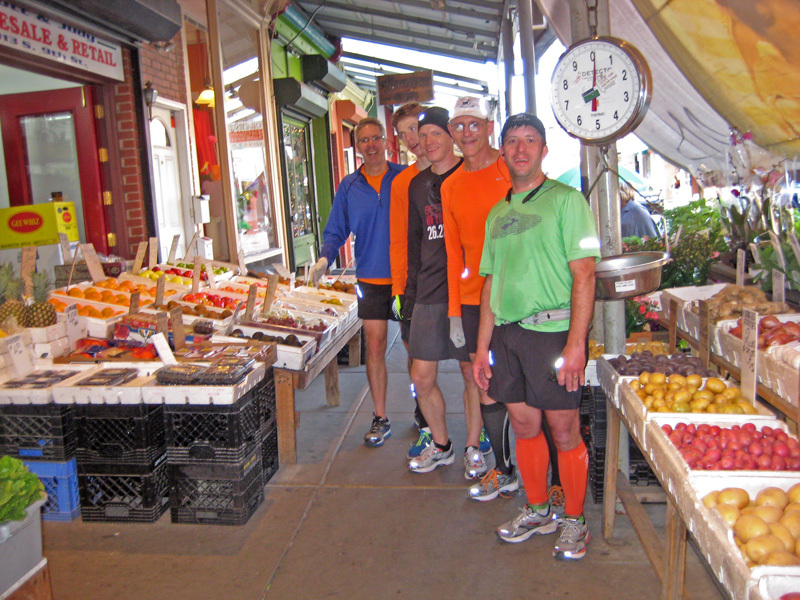 It is a busy place, even on a Sunday morning, and we got a few amused stares by the locals as we ran by. Nearby is the Walt Whitman house, where the famous poet spent the last eight years of his life. 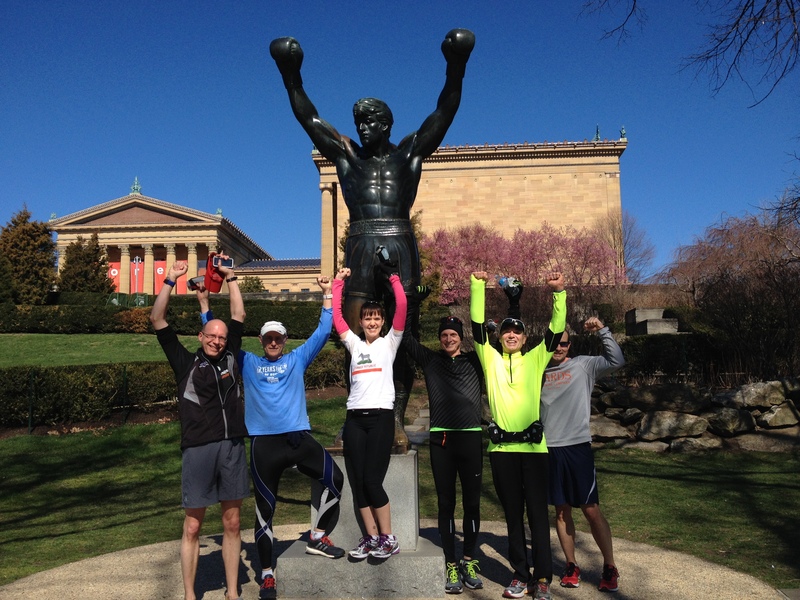 We did not run by his house, but may on future editions of the Rocky Run (Rocky III, the Leaves of Grass edition! 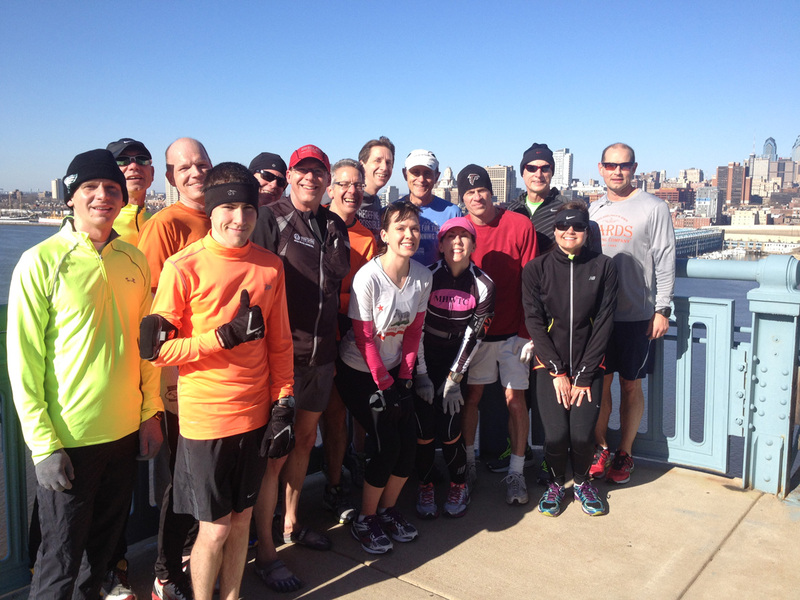 The first real challenge of the run was the stairs up to the Ben Franklin Bridge walkway. Three flights one must ascend to get to the walkway, and there were a few groans from our group, although nothing too serious. 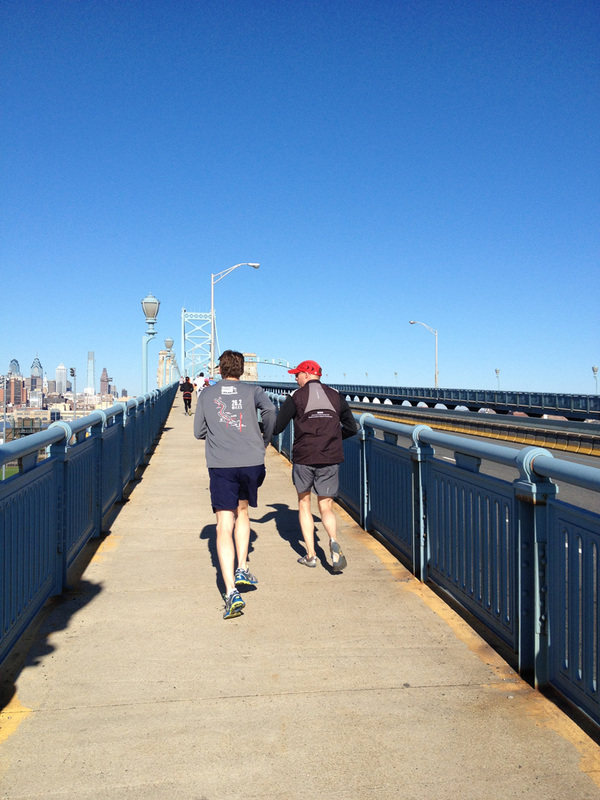 As mentioned, we had a beautiful day for this run, and the sky was deep blue, a perfect backdrop for the cityscape of Philadelphia. The bridge rises for three fourths of a mile before it turns down again. We stopped as a group near the apex for a photo, and got a nice passerby to take the shot. At the base of the bridge on the Philadelphia side we took a sharp u-turn down to “Old City”, and made the second change from last year’s route. This was to take us by another landmark, the Betsy Ross House. We took another brief stop to document our run. Then, it was on past other landmarks in the city, the Arch Street Friends Meeting House, the Constitution Center, the Liberty Bell, and, of course, Independence Hall, where the Declaration of Independence was signed. We continued down Sixth Street all the way to Christian Street in South Philly, home of the Italian Market. 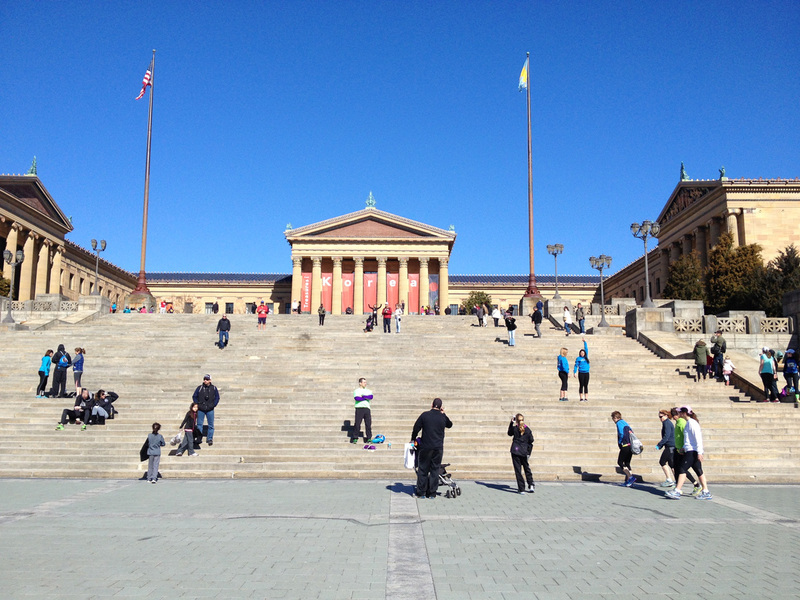 Rocky Balboa made this spot famous in several scenes in his movies. We didn’t try to replicate his movie runs. In fact, to that, one would have to have magical powers. If you’d like to see what it would take, writer Dan McQuade published an article in Philadelphia Magazine exploring the theoretical route. 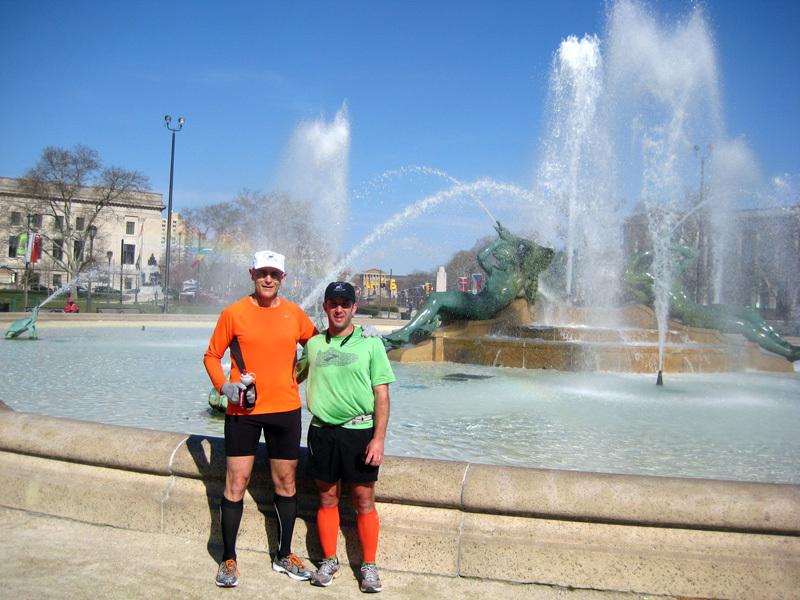 After passing my favorite pizza and steak place in the Italian Market, Lorenzo’s, we kept on running to 16th Street, where we headed north all the way to the Ben Franklin Parkway. The goal of the run was finally in view. 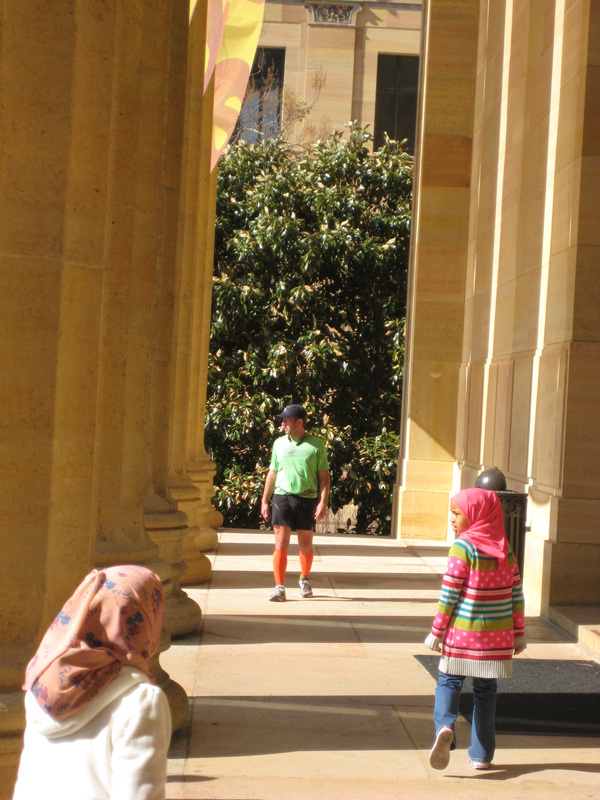 The Parkway is a great stretch of road, flanked by various museums, and lined by the flags of 109 Countries. 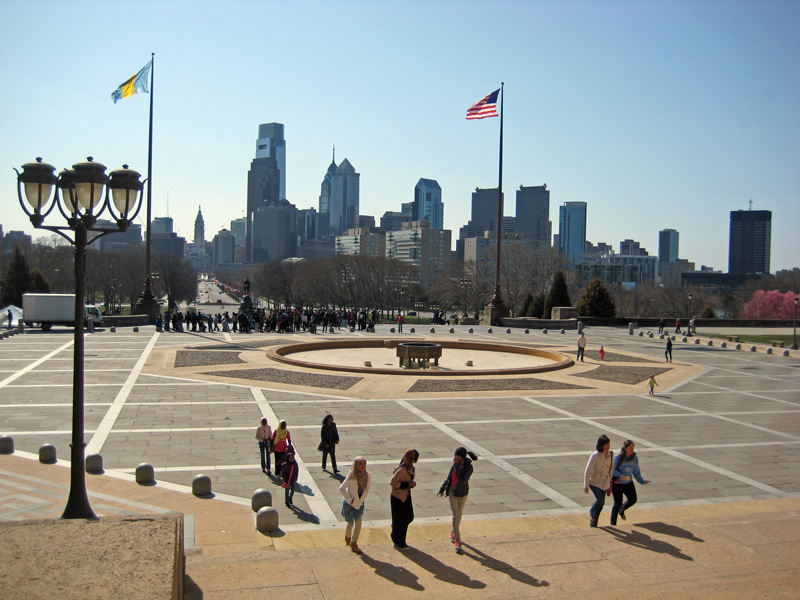 At the top of the Parkway, the Philadelphia Art Museum is a beautiful architectural achievement in its own right. 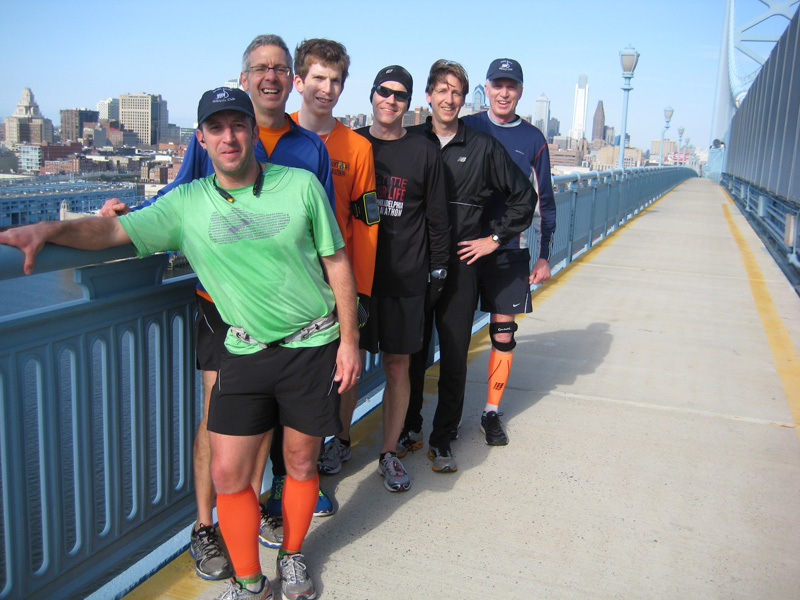 Situated where it is, braced on either side by Kelly Drive (formerly East River Drive) and West River Drive, and at the base of Fairmount Park, it is the epicenter of weekend outdoor activities in Philadelphia. West River Drive is closed to automobiles on weekend mornings during daylight savings time. Kelly Drive has Philly’s iconic Boat House Row, not just pretty to look at, but the base of a very active rowing community. 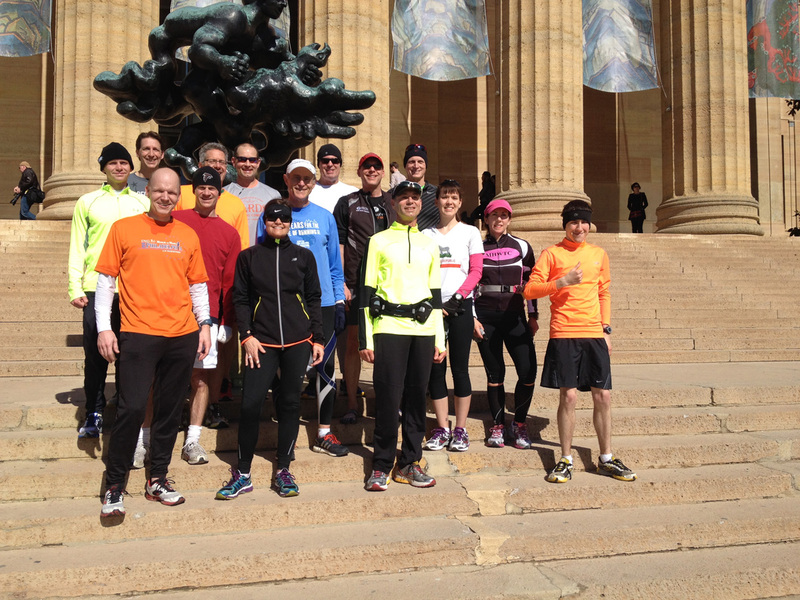 Every weekend, some type of race or organized activity is going on, centered around the Parkway and the art museum. This day was no exception. 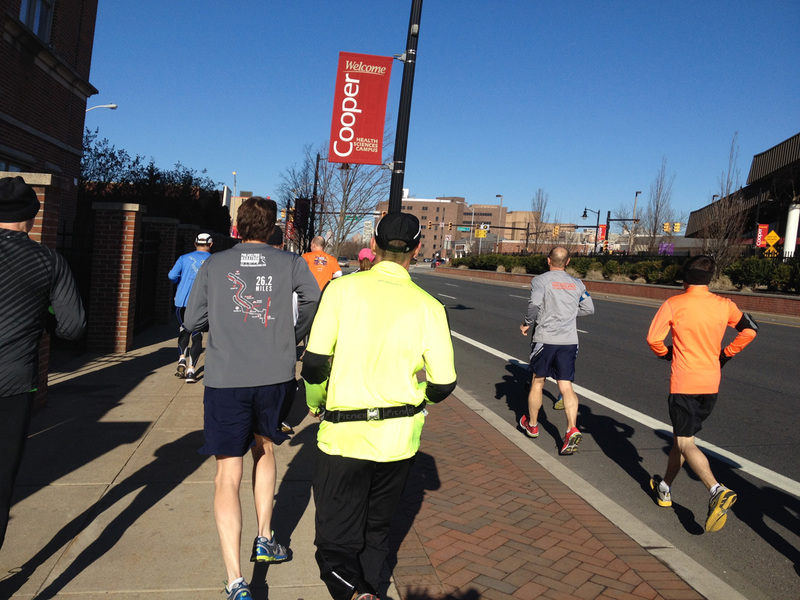 The first running of the Hot Chocolate 15k run was wrapping up as we finished our run. 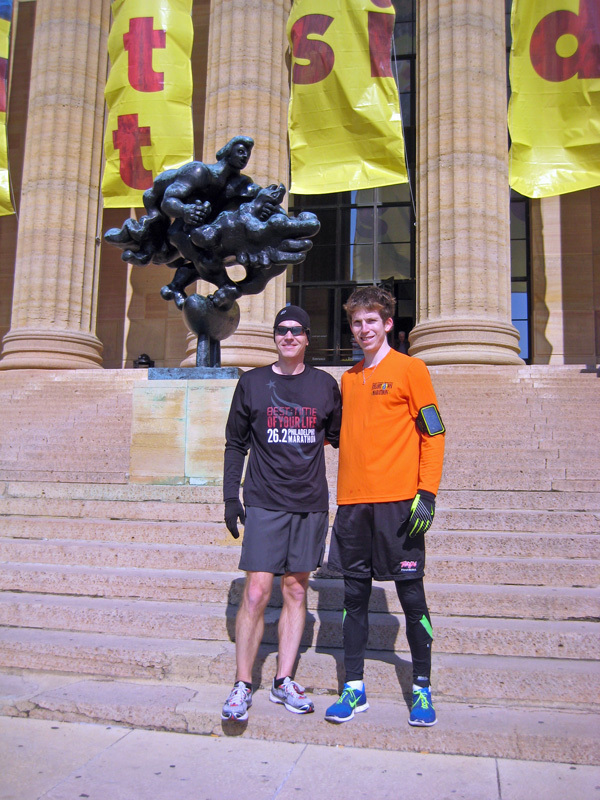 We ran straight up the middle of the Ben Franklin Parkway to the art museum. Starting at the Basilica of Saints Peter and Paul, along the way, we passed the Parkway’s most famous fountain, the Swann Memorial Fountain, or the Fountain of the Three Rivers. As we got close to the museum, we got funneled through the staging are of the Hot Chocolate race, and had to clamber over the barriers to get to our final goal. I found an open barrier so I didn’t have to embarrass myself trying to climb over, but others in the group were much more agile. Finally, it was up the steps to the art museum entrance. Of course, what would a trip to the venerable art museum be without a stop at the statue of one of Philadelphia’s most famous citizens, Rocky Balboa himself. Well maybe he wasn’t really a “citizen”, and I guess, maybe he wasn’t “real” but he sure brings out people from everywhere to pose by his statue. Giving the old Rocky pose. 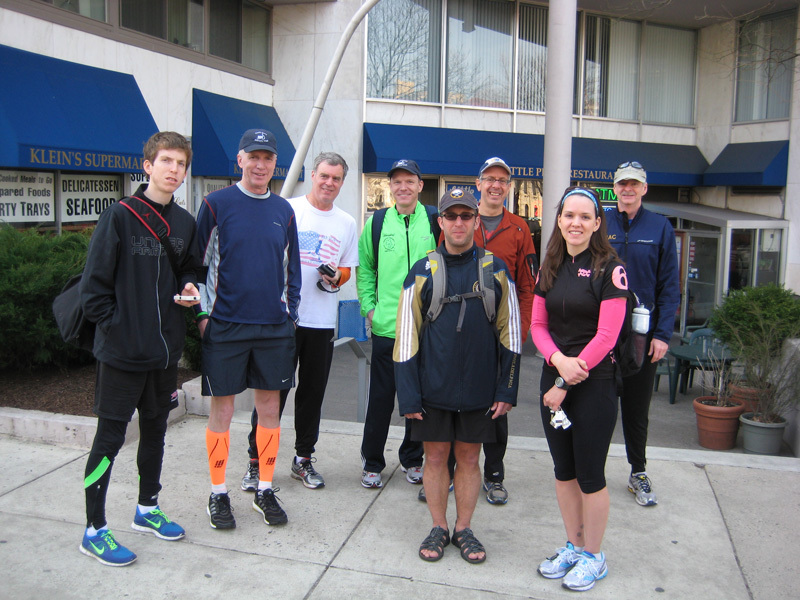 After we finished the run, we reconnoitered with a plan to have brunch at the famous Sabrina’s Cafe on Callowhill Street, about a mile from the art museum. When we got there, the place was teeming with people with the same idea, many of whom had run the Hot Chocolate run that morning. We wound up heading over to Friday’s on the Ben Franklin Parkway, not a unique Philly experience, but we were hungry. As it turned out, breakfast was over, and they were serving lunch. We were also almost their only customers. We had a very nice lunch of burgers, a some had beers, and all were quite happy. 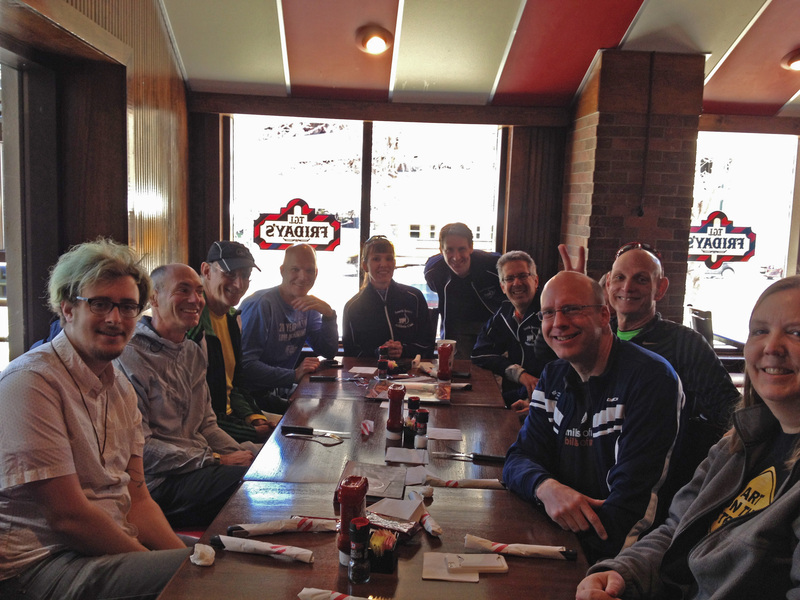 SJAC runners at Friday’s after the Rocky II run. 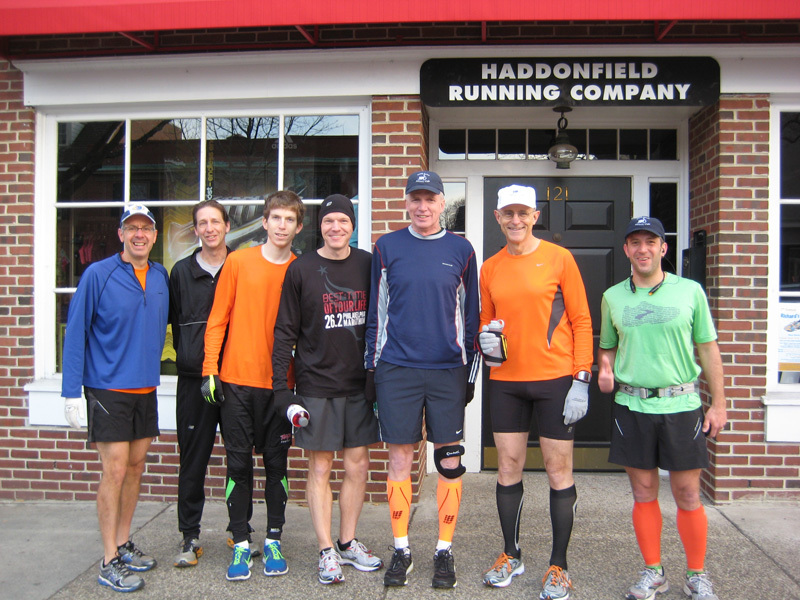 After lunch, it was back to Haddonfield. We had just enough room in a couple of cars to haul everyone back home across the bridge. Now, we’ll need to start planning next year’s sequel. 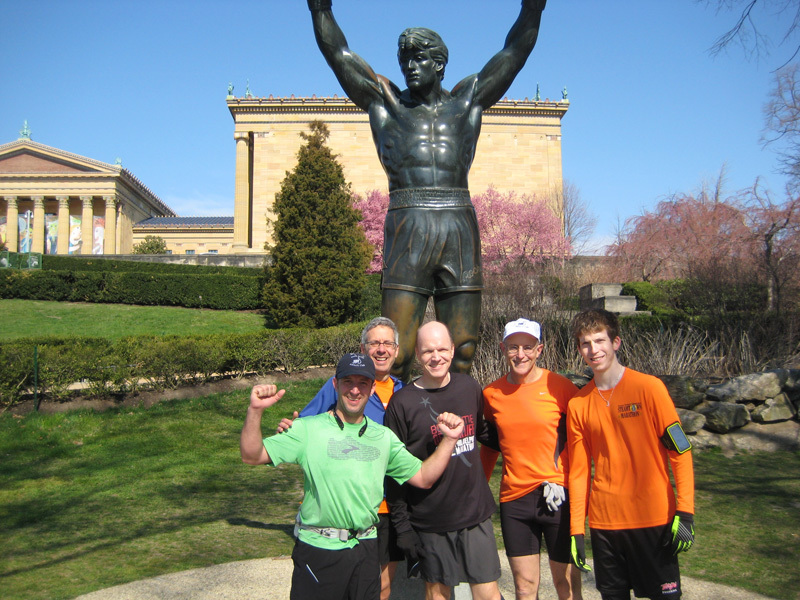 As one of our runners, Brian, put it, the sequels really went down in quality after Rocky II. Let’s hope the Rocky Run’s don’t suffer the same fate. Randy says so long, from Philadelphia!